If you like fishing two- or even three-nymph rigs, you know that one of the problems is the dropper line can tangle around the main line. George Daniel has a very simple solution for adding a dropper line that comes off the main line at a 90-degree angle, thus reducing tangles. And he accomplishes this with a simple clinch knot, which slides down on a surgeon’s knot. These are super-easy to tie, and I think you’ll see the benefits of this system immediately. Thanks for the tutorial. I will try this technique. A practical alternative to tying a whole new tag system. Thanks for sharing George! Very effective for guiding! Saves time on your clients fishing and catching !! 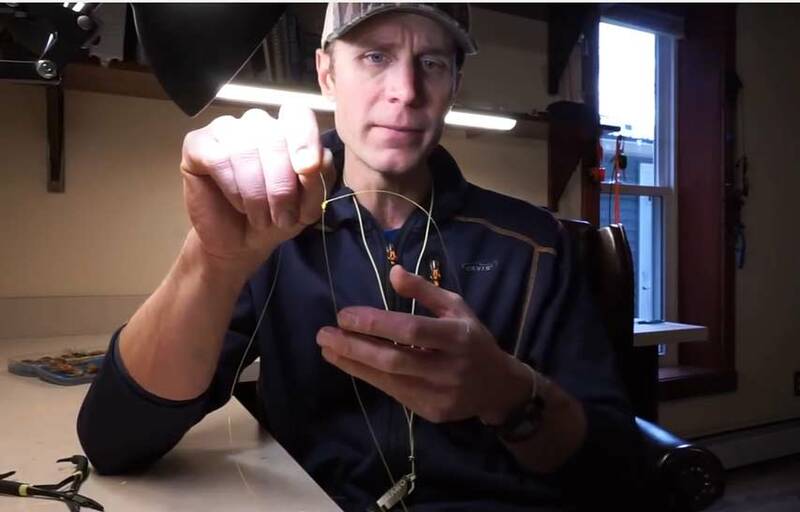 Instead of doing the surgeon’s knot for the “first” dropper, and then using the stop knot created by that to anchor the subsequent droppers, could you just tie an overhand knot in the “main” line tippet and tie the clinch know off against the overhand knot? I was wondering the same thing Liam. FWIW, the cinch and clinch knots are not the same. Did he just tie the knot around the bend in the hook instead of through the eye? I waste a lot o time trying to get the tippet though the eye . Thanks George, I have learned a ton from your books and videos. Keep them coming. Where do you add weight to this rig if you’re fishing a double nymph set up? Would you add it above the tag or at the bottom of the leader and run two tags for your flies?